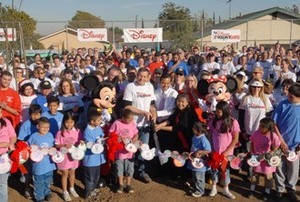 LOS ANGELES, Dec. 12 /PRNewswire-FirstCall/ -- The Walt Disney Company's (NYSE: DIS) President and CEO, Bob Iger, and 150 other Disney VoluntEARS, including the Company's senior management team, continued their commitment to give back to local communities and rolled up their sleeves today to build a new playground for the kids of the Boys and Girls Club of East Los Angeles. Known as the "freeway club," as it is located between two major highways, this Club daily serves more than 300 low-income children in the immediate neighborhood. For this "done in a day" project, hundreds of volunteers from Disney and the Boys & Girls Club built a playground that was designed with the help of the children. The project was completed in collaboration with KaBOOM!, TreePeople and other local community members. The group was later joined by Mayor Antonio R. Villaraigosa who participated in a special dedication ceremony further demonstrating his recognition of the Company's ongoing commitment to the City of Los Angeles. "Disney has been a proud partner of the Boys and Girls Club for more than 50 years," said Iger. "We are delighted to be working with the Boys & Girls Club of East Los Angeles to provide neighborhood kids with a wonderful new playground where they can play and imagine together." "Safe, clean and creative playgrounds make a world of difference for the children whose lives are brightened and enriched by these facilities," said Mayor Villaraigosa. "Thanks to Disney, KaBOOM!, the Boys and Girls Club of East LA and TreePeople, many young Angelenos will be smiling, laughing and playing here for many years to come." Since 2005, Disney has committed more than $7 million to the Boys & Girls Clubs Of America (BGCA), including a $1 million contribution to the Boys & Girls Clubs of Anaheim, the single largest gift that organization has received in its 16-year history, a total of $250,000 to 44 Boys & Girls Clubs in Los Angeles and Orange Counties and a $1 million gift towards the rebuilding of 16 Boys & Girls Clubs in the Gulf region that were damaged or destroyed by the hurricanes. Disney's history with the Boys & Girls Clubs of America spans more than 50 years, beginning when Walt Disney was an honorary member of the organization's Board of Directors. The new playground was presented to Anna Arauju, CEO, Boys & Girls Club of Los Angeles, by Mr. Iger, who was joined by Mayor Villaraigosa, at a special dedication ceremony immediately following the build. "To see Disney volunteers from all lines of business, side by side with our parents, staff and local college students was a moving display of community spirit," expressed Arauju. "The generosity of The Walt Disney Company, and the support of KaBOOM! and all of our community members who donated their time and services, allowed our children to experience how much people care about them, and that is a priceless gift that can truly change a life. In light of the very little green space in East L.A., this new playground will allow our children to play and get exercise in a safe area." Today's project was Disney's third playground build this year in collaboration with KaBOOM!. In April, the Boys & Girls Club of Slidell officially reopened its doors when more than 175 volunteers from Disney, ESPN and the Boys and Girls Club of Southeast Louisiana, organizers from KaBOOM! and residents of the Slidell community joined together to rebuild the Club's play area, gym and more. In May, Regis Philbin and Kelly Ripa, the hosts of "Live with Regis and Kelly" (produced by ABC Domestic Television, a subsidiary of The Walt Disney Company), joined 450 community volunteers in New Orleans to build a playground for the children of the Charles R. Drew Elementary School. The school sustained significant flooding and damage from Hurricane Katrina and serves 600 students. Disney brightens the lives of children in need around the world through global outreach programs, local community initiatives and the Disney VoluntEARS program. Last year, Disney donated more than $177 million in cash and in-kind support to various charities throughout the world, and Disney VoluntEARS contributed more than 466,000 hours of service. The Disney VoluntEARS program provides opportunities for Disney employees to contribute their time and expertise towards making a positive impact in the communities they serve while furthering the traditions and ideals of The Walt Disney Company. For more information on Disney's outreach efforts, please visit http://www.DisneyOutreach.com. KaBOOM! is a national nonprofit organization that envisions a great place to play within walking distance of every child in America. Since 1995, KaBOOM! has used its innovative community-build model to bring together business and community interests to construct more than 1,300 new playgrounds, skateparks, sports fields and ice rinks across North America. KaBOOM! also offers a variety of resources, including online community, regional and national trainings, grants, publications and the KaBOOM! National Campaign for Play, which includes Playful City USA and the Playmaker Network -- a national network of individual advocates for play. Headquartered in Washington, D.C., KaBOOM! also has offices in Chicago, Atlanta and San Mateo, CA. For more information, visit http://www.kaboom.org.